On the lighter side, when we have expired or damaged product from the Health Ranger Store production floor, I usually take them to my ranch and feed them to the many animals I care for. That includes the rescue donkeys that I originally adopted in 2011 after the horrendous Central Texas fires. Those two donkeys went on to have several offspring, and we now have a donkey family living on the ranch. 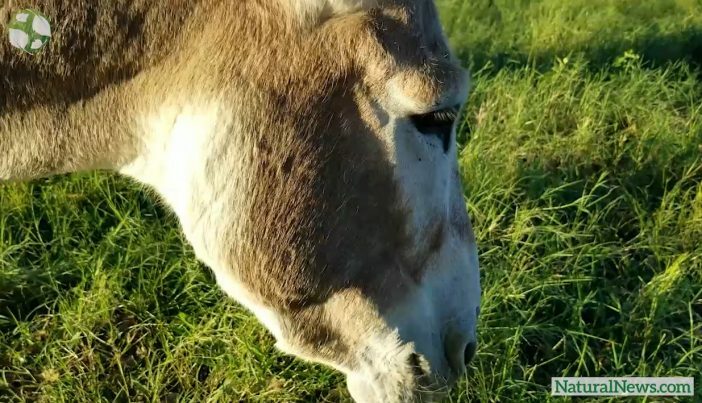 These are the luckiest donkeys in the world, because they get to enjoy all the Health Ranger Store products that can’t be sold to the public due to damage. For example, we’ll often receive a pallet of organic flax seeds with one of the 50-lb. bags punctured by a forklift. So that bag can’t be used in production and it goes to my ranch. That’s how my donkeys end up consuming organic flax seeds, organic raw almonds, organic millet, organic oats and much more. These are the luckiest donkeys in the world! By the way, if you’re wondering why we don’t donate this food to the homeless, you may not be aware that people are now being arrested in Texas and other states for giving food to the homeless without a government permit. Yes, it’s insane, and the government is completely out of control, but that’s another article for another day. Recently, I scored a 50-lb. bad of organic turmeric root powder. I put most of it in the freezer for use in my smoothies — yes, I don’t care if the bag was punctured, as it’s still perfectly good turmeric powder for personal use — and decided to feed the rest to the donkeys. The Health Ranger Store also sells turmeric for humans! Get lab-verified, glyphosate-tested products at HealthRangerStore.com.